A recent clicker-happy night on Flickr brought me to the incredible image above. Tom Rovers writes: “This temple is in the middle of nowhere, after you enter it's just a giant hole in the floor with stairs all arround.” Though I suspect it's not the temple proper but its stepwell, the self-similar subterranean hydrological architecture of the Subcontinent. It's water conservation at its most magnificent. A Google Image search for step-well, stepwell, and stepwells returns quite a few more awesome examples. Requires sifting through the results. And of course, check out the mother of all stepwells. POSTSCRIPT #1: Title changed from Harshshat Mata. See comments. POSTSCRIPT #2: Can we build a few of these stepwells atop the Ogllala aquifer? Robotized and with built-in AI computers, so that as the aquifer continues to be pumped dry, they would automatically dig down to follow the receding water table. Or perhaps even instinctively go in search of other aquifers. A landscape, architectural and infrastructural divining rod. And maybe centuries later, landscape architecture students on field trips can go spelunking through a karst landscape not unlike an Escher print. Of course, I would then wonder how deeply would they be willing to go? How much of the wilderness would they be able to handle? POSTSCRIPT #3: Meanwhile, they would be the perfect venue for productions of Don Giovanni and Faust. As the opera progresses, the company slowly descends to the waters of the Styx below, one heavy, measured, ominous step at a time. POSTSCRIPT #4: How about an avant-garde staging of Dante's Divine Comedy? POSTSCRIPT #5: The Fall, directed by Tarsem. Apparently this is not the temple, but the stepwell called Chand Baori next to it. Thanks, sophie. I was wondering why a Google search for "Harshshat Mata" did not return any hits apart from that photo. 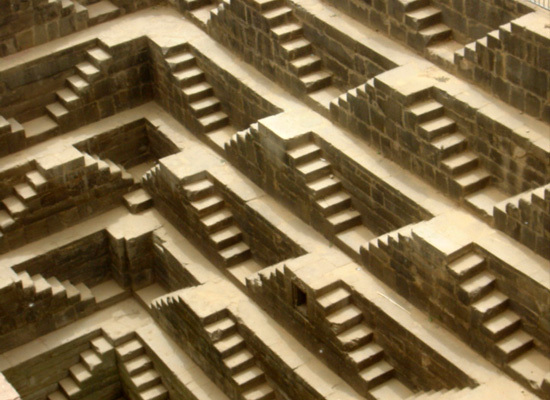 And for convenience, here's a clickable link to that collection of stepwells. Wow that is a fantastic picture. I have been by your blog a few times and find it very interesting. Some material I just can't comment on ....just because of my ignorance on the subjects.